Summers are often chocked full of fun and adventure, so it’s easy for back-to-school to sneak up on you. If you are like many parents, you may have failed to schedule a back-to-school dental visit for your child, but that checkup is key in fighting the most common chronic disease found in school-age children: cavities. And according to the American Dental Association (ADA), dental disease causes children to miss more than 51 million school hours each year. Luckily, if you missed the chance to get them in before school started, it’s not too late. Your dentist can help spot any issues that are found, and also help a child get “back on track” if some of their dental habits fell away during summer. It’s common for dental habits to change in the summer, when normal routines are different, and there are more treats around. Besides checking your child’s teeth and gums, the dentist will also check for alignment and bite issues, and also make sure their baby teeth are coming out (and in) on schedule. Even the best at brushing can’t get all of the bacteria that leads to cavities, so a good cleaning is a must. It gets rid of cavity-causing bacteria, helps to keep gum tissue healthy, and can even remove some stains from the teeth. Your child’s dentist may want to do an X-ray to see how the teeth are developing, and to check the health of the roots. An X-ray will also show any tooth decay between the teeth. The sooner decay is spotted, the less damage it can do. Does your child wear a mouthguard for sports? If your child plays sports and wears a mouthguard to protect their teeth, make sure and take it to their dental appointment. The dentist should check it for wear and tear, and make sure it is still fitting well. As a child grows, and teeth come and go, a new mouthguard may be needed to keep up with their growth. Sealants can be a great way to keep your child from getting cavities. They are thin protective coatings that your dentist can put on your child’s permanent molars to prevent cavity-causing bacteria and bits of food from getting stuck in places your child’s toothbrush can’t reach. Sealants on their permanent molars can reduce the risk of cavities by 80%! The best ages to get sealants are usually at age 6, and then again at age 12 — as soon as your child’s permanent molars come through their gums. If your child already has sealants, then your dentist checks to make sure they’re holding strong at their appointment. Encourage good dental habits for each age. Children 6 and younger should be supervised while brushing, even if they think they can do it themselves. Between 7 and 12 years of age, you may find yourself having to push and encourage your child to brush and floss regularly, so parents should stay engaged with their dental routines. The teen years can pose risks for decay, since they normally take care of themselves without adult supervision, and sometimes don’t see dental health as important. Pick which child goes first. If you have more than one child seeing the dentist in one day, schedule the first appointment for the child that has had the most positive experiences at the dentist. The other children will be encouraged when their sibling going before them is relaxed and happy. Choose a good time of day. If your child is young, you don’t want to schedule a visit at naptime, or when a child is normally hungry or cranky. For older children, it’s not always best to try and fit in an appointment after school. If they’ve had a long or stressful day, they may not be in the best of moods for the appointment. Don’t set them up to fail: choose a time that works best for them. Feed the beasts. If your child is hungry, there’s a good chance they’re cranky too. So feed them a light meal, and make sure they brush well before the appointment. Get a grip on yourself. Adults get anxious about dental visits too, and chances are if you’re nervous, your child will pick up on that. Communicate openly with them about what to expect if they ask, but don’t be negative. Let them know that their dentist will answer all of their questions before doing anything, and that there is nothing to fear. Don’t panic if things don’t go well. So what happens if your child gets upset during the visit? The last thing you want to do is give up and take them home. Chances are they are acting out due to fear, or lack of control. So work with your dentist to keep things going. Let the dentist take the lead, and support what the team says. 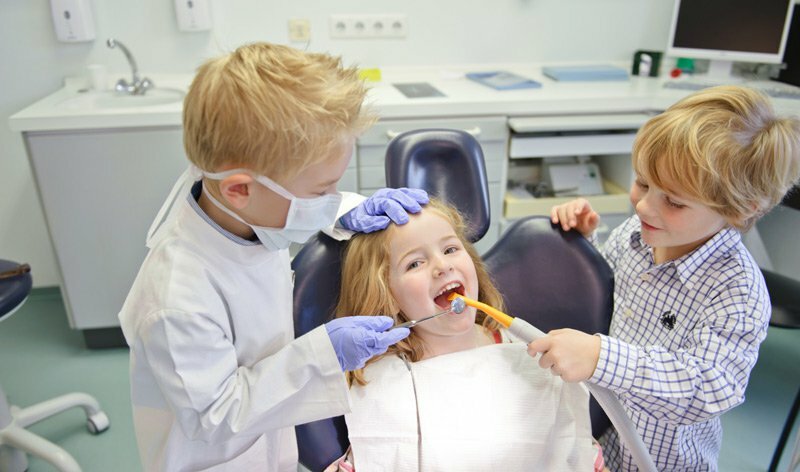 This is a time for your child to build a relationship with their dentist, so let them work their magic. For more tips on successful back-to-school dental appointments, visit the Mouth Healthy website of the ADA.